Today marks the birthday of Joseph Damer, 1st Earl of Dorchester. The Earl enjoyed great wealth and privilege and made a career in Parliament yet he is not remembered for his political wiles, but for the town that he created. 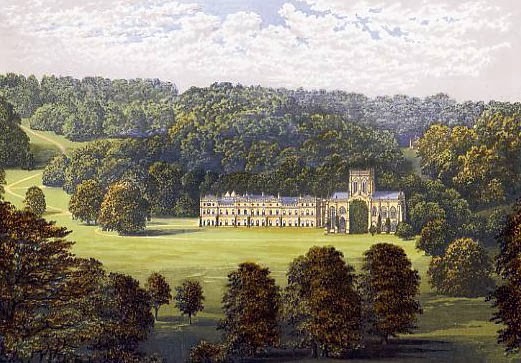 The ambitious Damer bought Milton Abbey in Dorset with the intention of tearing down the older buildings on the estate and replacing them with a brand new mansion. Not only that, but the parkland would be completely landscaped by the greatest names of the day. With this in mind he engaged Capability Brown, who was charged with transforming the grounds of the house. Key to Damer's plan was the construction of an ornamental lake yet right on the spot he had earmarked for this particular water feature there just happened to be a fully populated, albeit small town named Middleton. Brown and the architect Sir William Chambers were now charged with designing a brand new village for the residents of Milton, well-away from the Abbey and nowhere where they might disturb the peace of the Earl. To this end the village of Milton Abbas was created from scratch and those residents of Middleton who did not move away under their own steam were shifted into their new homes. With the town now empty, Damer could proceed with his plans and most of Middleton was razed to the ground in the latter years of the 1770s. However, there was one dissenting voice as lawyer William Harrison refused to give up the four leases he held on property in Middleton. Not to be deterred, Damer attempted to flood Harrison out of his house and the outraged man took the Earl to court. It must have come as something of a surprise to Damer when the court ruled in favour of Harrison and he returned home to Middleton in triumph. Harrison could not live forever though and when he passed away the frustrated Damer could now complete his ambitious project, finally achieving his dream of utter seclusion. Not sure I like this chap very much! Reminds me too much of the old land disputes and evictions in Ireland during the famine. Good to see that money doesn't always win, though. Damer didn't have many fans during his lifetime either; he was a difficult chap to like! You mention the court case between Damer and Harrison. Do you know the date of the case and where it took place? Leave it with me, I shall have to do some scouring! Some people have nerve! I suppose some of the people were glad to have newer homes, but what about those who did not want to go? I'm so glad he lost his case. At least he did not get his water feature as soon as he wanted it--and he'd spent a good amount of money building a village and moving people. To naught. I was glad he lost it too; he took on the wrong chap! I have come across Joseph Damer before. If I am not mistaken,he was an Anglo-Irish grandee with large estates on both sides of the Irish Sea,the sort we in Ireland refer to disparagingly as an "Absentee".Had this taken place in 18th century Ireland,he would most likely have evicted his tenants and left them homeless.Estate towns and villages were the exception to the rule. He sounds like a thoroughly unpleasant sort! I have discovered there is one good thing Damer did, and for a local Milton boy: the drawing & esp. portrait abilities of young Thomas Beach (1738-1806), whose father Thomas was innkeeper in the town, opposite the famous school (which is now in Blandford and which both Thomas and his older brother William attended). Dad died when Thomas was young, yet Damer paid for him to study under Joshua Reynolds in London from where within a couple of years he launched a very successful life as a portraitist both in London but mainly Bath and all around the country houses in Dorset and Somerset. Damer not only paid for the London studies, he was a committed patron of Thomas for the rest of his life and frequently had him to stay at Milton Abbey as a guest in his own right, meeting other guests including high ranking aristocracy on equal terms. I know this is only one thing for one person, but like everyone else I find Damer hard to like, so it’s nice to discover something positive. Sandra R.
What a marvellous discovery; thank you so much for sharing it with us!